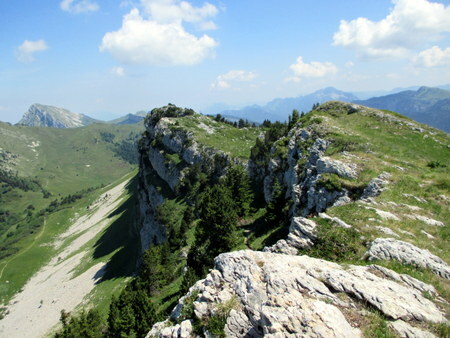 The Rochers de Chalves seen from the east looks like a distinctive entity in its own right within the Grand Sur massif, rising some 900 metres above the Tenaison valley. From the west, however, although it has some fine summit cliffs overlooking the Chalet des Bannettes there is only 100 metres height difference. This circular walk (map) ascends the eastern slopes to the summit, drops down to the chalet on the west, and then returns around the northern flanks. Most of it is in the shelter of the forest and suitable for when respite is needed from the sun, but it does has a very fine open summit. Much of the route is seldom walked and you're likely to have it to yourself, so it is particularly suitable for when it's likely to be busy in the main areas. The walk is approached from the Col de la Charmette road, the D105. About a kilometre past Pomarey an obvious track takes off to the left. There is a large parking area about 50 metres down this track (900 m, grid ref. UTM 31T 71330 50191). From the car, follow the track down to the river, catching occasional glimpses of a waterfall below. Across the river, take the older track on the right ascending the hill. This is pretty steep, but not unpleasant with its accompanying sound track of bird song from above and the river from below. After half an hour the path turns in front of a cliff. A few minutes later a small path takes off to the left marked by a small cairn. It traverses round and then rises up a small ridge to meet a new track. Make note of this junction, as our descent route comes in from the right and we will return down the path we just ascended. Turn left, and after five minutes or so the track skirts a large meadow, the Prairie de Grandchamp. Enter this and go up the left hand side. Ignore the first wide earthy track that ascends a slope to an old habert, and look for a thin path 50 metres above that. There's a cairn close to the beginning. Note that the path from here to the summit is not on the map. Nevertheless, it is a fine path that rises gently through the woods, and is full of bird song and red squirrels. After half an hour a tree with a couple of red markings and the sign HC4 will be encountered - these are more-or-less the first way marks of the day. The path turns back to the right here. A few minutes later, an old shelter is passed, and the path skirts a clearing. Soon after the path trends to the left in front of another clearing, and starts uphill. The way underfoot isn't crystal clear on the ground, but some ancient orange blobs do give reassurance. Before long the path starts to rise through some cliffs and above the tree line onto the prairie, where some care is needed to follow the right line. The gradient soon flattens out to enter more open ground adjacent to a large shakehole, with the summit slopes above. Here the path goes off to the right, and within 20 minutes the summit cairn is reached. When we were there, it was decorated with Buddhist flags scattering their prayers to the winds. It takes about three hours for the ascent. The summit is a great viewpoint. Immediately below is the Chalet des Bannettes, and to the west, there is a fine view of the Isère river as it sweeps round the north-east corner of the Vercors. To the north is the Rocher de Lorzier and beyond, the Grand Sur. It's a good place to lunch. To return, go north along the ridge for 50 metres, and drop down an easy gully. Once below the cliffs, you can either pick your way across the scree to reach the main path straight away, or traverse north under the summit cliffs and pick it up after it has started to swing to the east back towards the forest. The main path is well marked with yellow blobs, but there are a number of variations - just generally make towards the valley floor. Once back in the forest, there is a very positive junction in about ten minutes marked with a cairn. Turn right down a path that starts off by gently meandering through the trees before descending a steep ridge finishing on a smart forest track. This is the one encountered earlier in the day. Follow it for about quarter an hour to return to the ascent path. This is then followed back to the car.